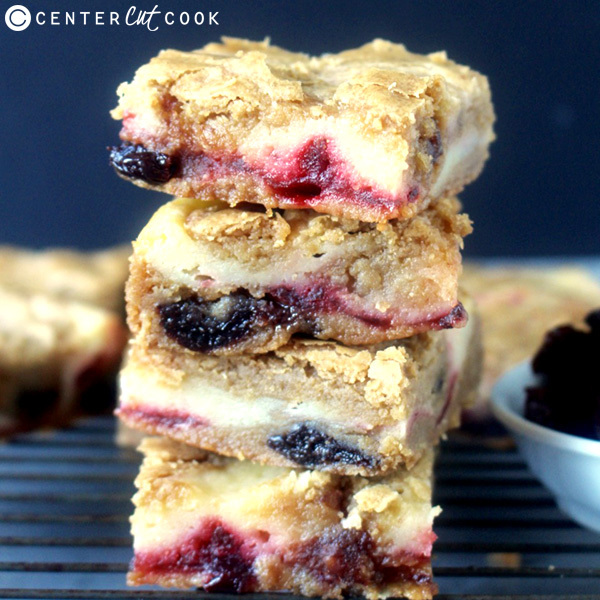 These Cherry Cheesecake Blondies combine brown butter, chewy cherries, and sweet cheesecake to make the best blondies ever! Last week I brought you my Lemon Zucchini bread that won 3rd place in a competition, so I thought this week I would bring you a recipe that took 1st. 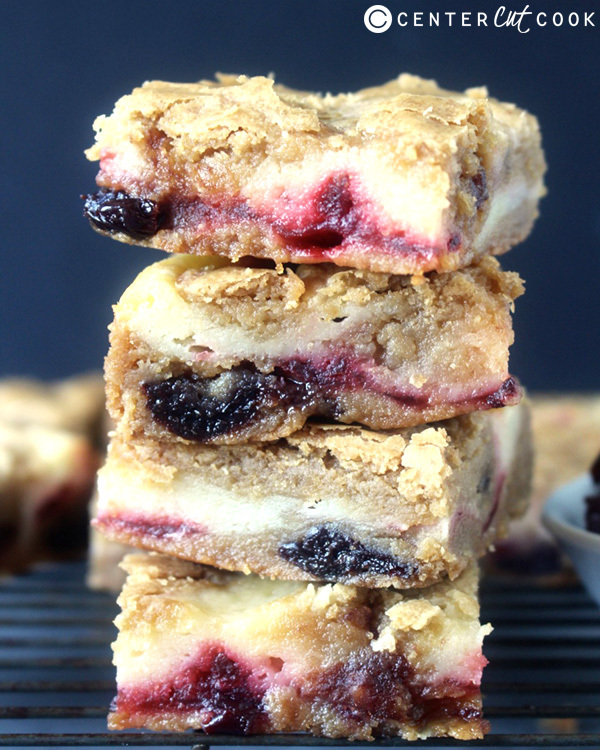 These blondies were entered in a cherry competition and came out on top. One bite and you’ll realize why! They are the perfect combination of sweet, chewy, with a nice burst of freshness. Brown Butter is what really sets these blondies apart, but don’t be afraid of that! I read so many recipes using it before I tried it because I thought it would be hard- that is totally not true. It is so easy and so worth it! My best tip is to use your eyes, ears, and nose all together to tell when it’s done. It will go from bubbling and making noise, to silent, foaming, and having a nutty aroma. As soon as that happens, turn the heat off or it can quickly burn. No leavening agent (baking soda or baking powder) means these are super fudgy and dense. 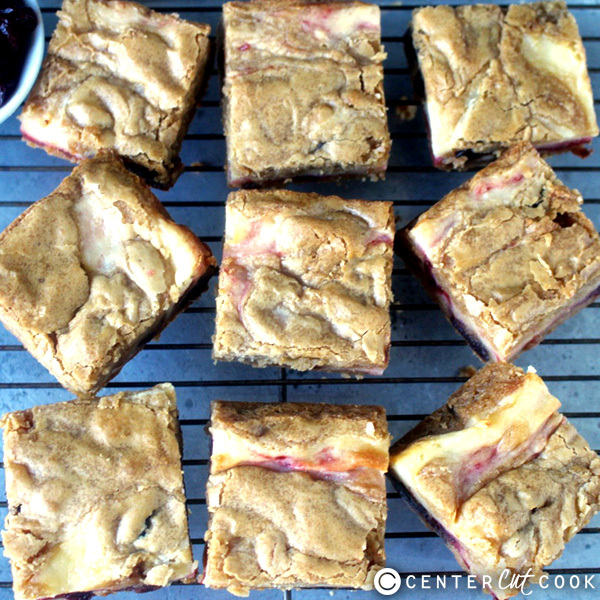 The brown sugar and brown butter give the blondies a real depth of flavor and keeps them chewy and soft. The cherries add a nice freshness and their chewiness is the perfect contrast of texture. The cheesecake layer…what can I say, everything is better with a layer of cheesecake! It is 4 simple ingredients mixed by hand and it is so delicious. It’s not too sweet so it’s a nice balance to the rich bars. They come together fairly quick. Once the butter is browned, they’ll be in the oven in no time. They are stirred by hand so there’s no need to get out the mixer. All the measurements for the blondies are in whole numbers so it’s easy to remember. 1 cup butter, 1 cup cherries, 2 cups brown sugar, 2 eggs, 2 cups flour (the salt is the only thing that doesn’t fit this). Make them once and you can have it memorized. Make sure you read the whole recipe through before starting. The directions are not in the order you would think-but it’s not complicated! Make the cream cheese layer first. In a medium bowl, mix cream cheese and sugar together until smooth. Add in the egg and vanilla. Stir until completely smooth and no lumps remain. Set aside. Place cherries in a large bowl. Put butter in a medium skillet and cook until browned. This should take about 10 minutes- whisk regularly to make sure it doesn’t burn. Pour over cherries. While cherries are soaking in the brown butter, line a 13×9 with foil and spray with non-stick spray. Add in the brown sugar to the cherry/butter mixture and stir until combined. Add in the eggs and vanilla and mix well. Add in the salt and flour and mix until fully combined. Pour half of the mixture into the pan and spread as evenly as possible. Top with cherry preserves then the cream cheese mixture. Top with remaining batter and swirl a little with a knife. Bake for 35-40 minutes or until lightly brown. Let fully cool before cutting and serving.